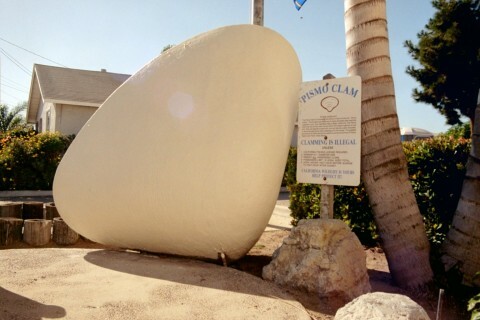 There are actually two World’s Largest Clams in Pismo Beach – one at the enterance sign, and another at the Chamber of Commerce. I stopped in the Chamber while there, but they didn’t have any actual information about the clam itself, but did give me the number of the town historian. I was glad to see that they’d removed the painted American flag that had been applied like a window decal to the clam, so it did actually appear very clam-like. Accompanying the sculpture is a posting of the Pismo Rules and Regulations for clamming. A block up from the waterfront is a lunch counter (called ‘splash’ I think) with excellent clam chowder – you can smell the cream as you walk in the door. You’ll recognize it by the massive amount of locals inside and out. Mmmmm good. And while you’re by the ocean, don’t forget to dip your toes in and watch the surfers play with the dolphins. 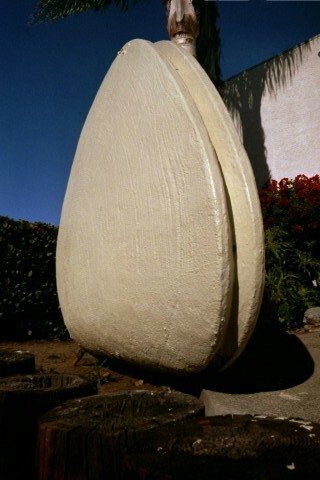 Nov. 20, 2008 - Just got an update from a reader, with this information: Subject: World's Largest Clams in Pismo CA FYI, the two clams in Pismo were created by my Grandfather, Freeman Davis, a local resident and sculptor for many years. He died around 1982, can't remember the exact year, think I was in third grade at the time. Thanks for making a web-site about them. The historical society should be able to confirm he is the sculptor.